Moore and Dorsey, Inc. was founded in 1929 by E.Blackburn Moore and Ralph N. Dorsey. Located in the northern Shenandoah Valley of Virginia, the business focused primarily on the production, packing, and shipping of apples. Nearly 90 years later, Moore and Dorsey continues to be operated by the Dorsey family but with a much different focus. 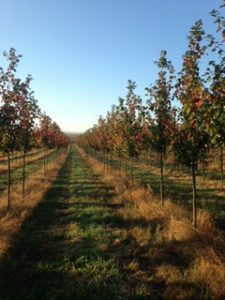 The apple trees have given way to grain fields, sod fields, and over 150 acres of nursery stock. We began planting shade and flowering trees almost thirty years ago and have recently added evergreens to our line. The Dorsey Family is proud to continue our farming tradition and to offer high quality plant material to the Mid-Atlantic area and beyond. In an era when many family farms are being lost to development, we are thankful for our customers support, allowing us to preserve our land. If you would like to see our current availability click here. If you have any comments or questions for us, please submit the form below and we will get back to you as soon as we are able! Sign Up For The Latest Inventory Changes!